December 17, 2018, 6:00 p.m.
Tis’ the (winter) season - but not every city is loving it. New data from YouGov CityBus shows that residents of many metropolitan cities say that they dislike winter in their city. 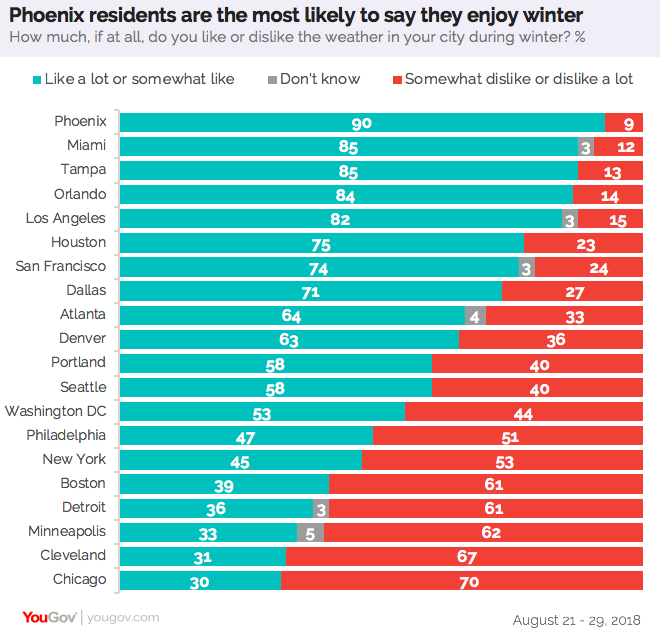 But the city where residents are most likely to say they enjoy winter is Phoenix. Nine out of ten (90%) residents enjoy the season, while only 9% say they don’t. It’s easy to see why - the average temperature in Phoenix in late December tends to be anywhere between 45 and 67 degrees Fahrenheit, far warmer than many other places in the US. Florida also looks to be a place where people enjoy winter. Residents of Miami (85%), Tampa (85%), and Orlando (84%) are some of the most likely to say they enjoy winter in their respective areas. Other cities where the majority of people enjoy winter include Los Angeles (82%), Houston (75%), San Francisco (74%), Dallas (71%), Atlanta (64%), Denver (63%), Portland (58%), Seattle (58%) and Washington DC (53%). Residents of Chicago are the least likely to say they enjoy winter, with only 30% saying they like it. A large majority (70%) of Chicagoans say they dislike winter. December temps in the Windy City tend to be between a chilly 21 degrees and 35 degrees Fahrenheit. Similarly, only 31% of Cleveland residents and 33% of Minneapolis residents enjoy winter in their respective cities. Detroit (36%) and Boston (39%) aren’t big fans, either. Learn more about YouGov Omnibus and CityBus. 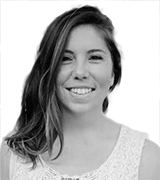 See what these cities have to say about the attitudes of people in their city and friendly neighbors.